The main theme of today's post will come as no surprise many parent, but may provide some useful insight for newbie parents and anyone who's feeling as if they're drowning in expensive toys that never get played with. How many times have you heard parents complaining that they gave their beloved child the best, brightest, trendiest toy that money could buy, but to the parent's disappointment the child was more interested in the wrapping paper and the box? How many of us learn from that experience - not many because, myself included, we get sucked into the idea that we are being cheap and somehow under-demonstrating the depths of our love if we fail to buy expensive gifts. Older children may genuinely feel hard done by if they don't receive the same branded goods as their peers, but little ones really don't buy in to that and it's worth making the most of those years. If you have small ones who do pester excessively for particular branded toys it might be worth looking at how much advertising they are being exposed to - we're TV limiters anyway, but completely avoid commercial kids TV because of the saturation of adverts on it. I remember well my own childhood angst at not having the shoes I saw on the telly that came with 'free' plastic jewellery, or deep upset at returning from a trip to the toy store without my own Boglin (a weird rubber gremlin puppet thing if you don't remember them). I was very well provided for in the toy department, but the adverts are extremely clever at making products seem essential. Think how well they work on adults, with our years of hardening against their wiles, and then consider that children are inherently impressionable and have no way of tuning out from the adverts. Once you fork out for the apparently desperately needed toy, watch just how many times they play with it. Also make a mental note of how they are interacting with it - are they just re-running an episode of the show it was based on? Now give them an empty box and watch them again - one day you'll have a spaceship, another day a boat, or a racing car, or a fire engine, or a castle. The difference is that they will be using their imaginations to a much greater extent, and have a much greater opportunity to develop the toy themselves - help them to paint it, cut it, stick things to it. Part of the reason that boxes and other non-plastic toys appeal so much to children is that they use their senses in different ways to adults. Adults are programmed for the most part to experience the world in a very audio-visual way and will see a plastic toy that flashes and sings as highly interactive. For young children however this is lacking the more important cues of texture, smell, taste and mouth feel. Plastic toys all taste the same and smell the same. 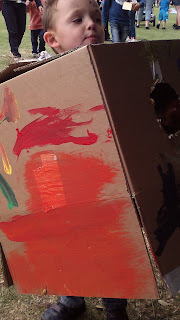 Manipulating a box into an imagined artifact or vehicle is much more stimulating, and will be even ,ore so if there are other children or a parent to share in the game. Often they will need help in creating what their minds can see, especially when they're very young. 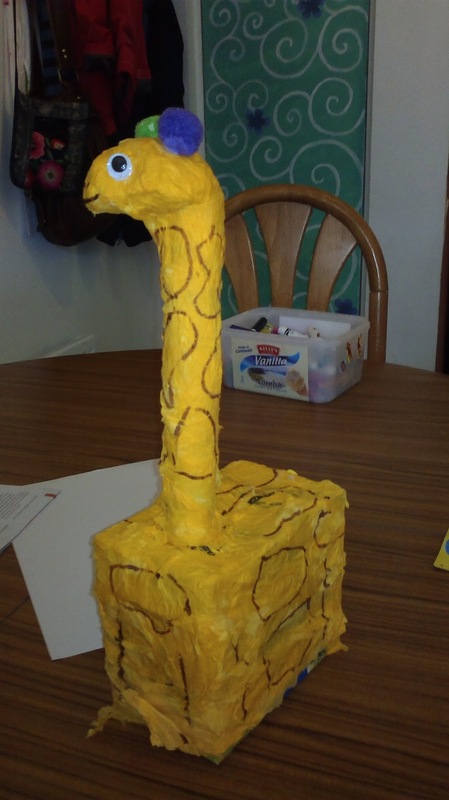 Ollie decided one morning last week that he wanted to make a giraffe, and a dig through the craft cupboard provided an empty teabag box (for the body), a nearly used-up roll of aluminium foil (the foil was scrunched up for the head and the cardboard tube provided a neck) and a small stack of yellow napkins. Mixing half and half PVA glue and water provided paste for him to stick his torn up napkins on to the basic giraffe shape I had put together for him. After it was dry he drew circles in a felt-tip pen for the pattern and added googly eyes, pompom ears and a wool tail. The top image was a 'save the day' toy after he got upset that his friend had a toy aeroplane and he didn't (he's going through a phase of comparing what he has with his friends - why is so-and-so's garden bigger, why do we have a blue car and they have a grey car etc...). Driving home from his friend in the pouring rain on a Sunday evening meant buying a toy plane was out of the question, so when we got home we just made one. 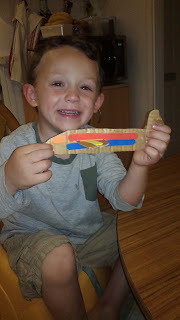 He went from sobbing his heart out to smiling in the space of five minutes of cutting up an old nappy box and gluing bits on to the basic shape. I did buy him a real one later in the week. No prizes for guessing which one is still being played with while the other sits neglected in the toy box. 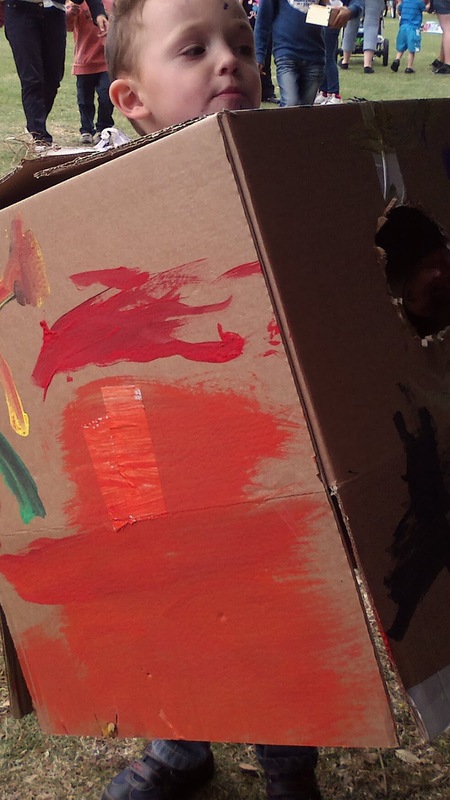 The final image is of the 'robot' he wanted to make after seeing a man walking around at our local play in the park day dressed entirely in boxes. A donation of a box and some paints from the kind activity organiser, a couple of minutes with the scissors on my part, and about 30 minutes of concentrated painting on it by Ollie and Toby and the robot was ready. Since we got it home it has so far mainly been a space rocket. Ollie even sat in it to have his lunch, insisting that I pass each item of food to him through the round window that had started off the afternoon being an arm hole. It is currently as flat as a pancake, but is easily resurrected with the help of a roll of parcel tape.